One-of-a-kind puzzle map set in original metal box! Puzzles include Railroad Map of the United States, County of Westchester, Europe, and County Map of New England. Improved Sectional Map: Railroad Map of the United States. / County of Westchester. / Europe. / County Map of New England. 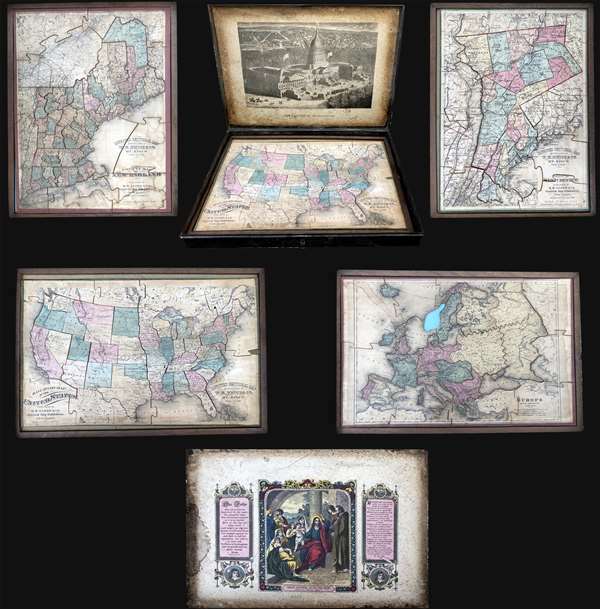 This is an 1877 set of four double-sided puzzle maps of the United States, Westchester, New England, and Europe contained in their original metal box. The verso of each puzzle also features an image, with a view of the United States Capitol Building on the verso of the United States puzzle and an illustration titled Christ Blessing Little Children on the verso of the remaining three puzzles. These illustrations also appear as pastedowns on the insides of the top and bottom portions of the metal box. The first puzzle depicts the continental United States from the Pacific Ocean to the Atlantic Ocean and from Canada to Mexico and the Bahamas. All the pieces are present, with each state (other than Rhode Island which is connected to Connecticut) separated into its own piece. Highly detailed, myriad cities and towns are labeled throughout the country, although the bulk of these are concentrated east of the Missouri River. As this is a railroad map of the United States, railroad lines are illustrated from coast to coast, although only a handful are labeled, including the Union Pacific and the Kansas Pacific. Certain lines, such as the Northern Pacific and the Southern Pacific, include dashed section, illustrating incomplete stretches of that line. The second puzzle depicts the county of Westchester, New York. The map depicts the region from the west bank of the Hudson River to Ridgefield and New Canaan and from Garrison's and Lake Mahopac to Harlem and Manhasset Bay. Highly detailed, each township is shaded a different color to allow for easy differentiation. Towns and villages are illustrated and labeled throughout, including Peekskill, Bedford, and Tarrytown. Several railroad lines are illustrated by thick black lines, such as the Hudson River Division of the New York Central and Hudson Railroad. The Croton Aqueduct, which supplied drinking water to New York City from 1842 until 1940, is illustrated from the Croton River in Westchester County along the Hudson River to New York City. The third puzzle depicts the continent of Europe from the Atlantic Ocean to the Caspian Sea and from the Arctic Ocean to the Mediterranean Sea and North Africa. Perhaps the most intriguing aspect of this map is the borders of Germany, which reflect German gains during the Franco-Prussian War when they took the provinces of Alsace and Lorraine from France. Austria-Hungary, the Central European monarchy, occupies part of modern-day Italy, and the Balkans are a part of the Ottoman Empire. One piece of this puzzle (Norway) is missing. The fourth and final map of the set is a county map of New England depicting from Quebec and New Brunswick to Long Island and from New York to the Atlantic Ocean. Counties are labeled and shaded different colors to allow for easy differentiation. Meticulously detailed, innumerable cities, towns, and villages are labeled, including every stop on each illustrated railroad line. Both Nantucket and Martha's Vineyard are illustrated and labeled. The same level of detail is present in Quebec and New York State. This set is rare and we have been able identify no other known examples. Given the size of the box it is conceivable that there is one map missing from the set, as one more would fit, but without another known examples, there is no way to know. Good. Set contains four separate puzzles: Railroad Map of the United States, County of Westchester, Europe, and County Map of New England. Europe map missing one piece, all others complete. Soiling to Map of Europe and County Map of New England. View of United States Capitol Building on verso of Railroad Map of the United States. Painting Christ Blessing Little Children framed by Lord's Prayer on verso of other three puzzles.